Just to give you some perspective, I have never seen an episode of the RahXephon series, so this review is not going to be a series-versus-movie slugfest. Instead, I'll give you an unprocessed perspective on an intellectually refreshing and visually beautiful movie. The main menu is clean and easy to navigate. Language options include: English, English with song subtitles, and Japanese with subtitles. I'm not sure why AD Vision made a separate English track with song subtitles, but I always appreciate more choices than the usual sub/dub routine. Scene selection, however, is an enjoyable feature -- when it's available -- and having it on this DVD was wonderful. Unfortunately, the previews were not something to write home about. Some people may appreciate genre-specific trailers, but I don't. My tastes are rather varied, and I have already seen many of the seasoned anime "classics". At this point in my anime fandom, I don't need a push to see Neon Genesis Evangelion, Devil Lady, and Gravion; they are not my cup of tea. (Sorry, Andrew.) Lastly, standard DVD credits are also included. 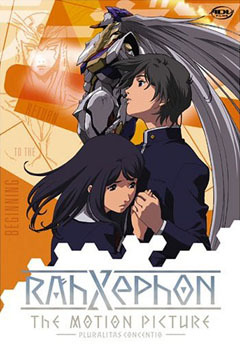 I watched all of RahXephon: The Motion Picture twice; once in English and once in subtitled Japanese. The script seemed nearly identical through the film, varying mostly at cultural references. The voice acting ADV supplied was up to their usual high standards, though I admit to enjoying the original seiyuu voices. (I am used to subtitles now.) The dialogue is excellent, flowing naturally in conversations. Some relationships are only sketched out, but I feel that is one of the limitations you find in a movie as opposed to a 13- or 26-episode series. RahXephon: The Motion Picture opens with a seemingly typical anime love triangle at school after class: unrequited love girl walks in on boy she likes who is about to kiss the girl he likes (and who likes him back). A barrier that looks like the planet Jupiter suddenly rises around Tokyo (where else do things like this happen? ), and the lovers are separated. We are then tossed into the future, where three years have passed for Ayato Kamina, the aforementioned boy (our main character), and fifteen years for Haruka Mishima, Ayato's never-forgotten sweetheart. This sudden time warp and worldly alteration were incredibly disorienting. Ayato and his friends, Asahina and Mamoru, believe the lands outside of Tokyo destroyed, but he keeps having visions of Mishima alive. One day, Ayato is kidnapped and awakens the power of RahXephon, a giant robot with wings on its head like the Siren from Final Fantasy VIII. He saves his would-be kidnapper (who just happens to be a woman named Haruka *hint*) from another robot. They later rouse in the world outside, a world not very different from the earth before that fateful Tokyo Jupiter. You may see how this twist can be confusing for someone new to this universe. We receive explanations while Ayato learns the truth about the realm. There was a war between Humans and the Mu, alternative world humans with blue blood and advanced technology. The Mu erected the Tokyo Jupiter, sealing off Tokyo as their base, and the war has been at a standstill since. Time flows differently inside the sphere, however, so a month outside is a week inside. The colossal robots are called Dolom, and Mulians can only exist on Earth when a Dolom synchronizes with a human. RahXephon, however, is a special case. It has the power to re-create the world or to destroy it, depending on its pilot. Does this plot sound familiar? RahXephon: The Motion Picture is strangely like Evangelion -- only more sophisticated, with a higher budget and a readily understood philosophical plot. The Mulian desire RahXephon to turn Earth into another Mu. They believe Ayato shall accomplish this because he is half-Mu and his genes are designed to obey. Nevertheless, Ayato is also half-human, a complication which his mother and Mu leader, Maya, never expected. Further drawbacks come from Asahina, the unrequited lover. As it turns out, she is also Mulian and slowly realizes the truth about the world while she loses her human memories. Ayato removes Asahina from Tokyo yet her blood already turned blue. Seeing an approaching Dolom, Ayato vows to watch over her no matter what. In a heart-wrenching scene, we see Ayato in RahXephon fight the Dolom, which is actually Asahina's Mu self. Each blow is reflected onto her human body as she tries to write her thoughts for Ayato in her diary. Ayato recognizes too late what he has done: he killed someone who he swore to protect and loved him unconditionally, as well. I won't delve further into the plot; let's just say it is Evangelion-esque. It follows the theme of memories creating the past and it does not matter if our memories are real or not because they are real to us. A major character – Quon, who slept throughout most of the film -- is tossed in as Ayato's female counterpart for the RahXephon. I did not appreciate this because Quon was left as an enigma and entered with godly power levels. Still, she seemed like a fascinating character, worthy of more screen time and better (overall) than Evangelion's Rei. RahXephon: The Motion Picture was an excellent movie and one that I definitely recommend -- even to non-mecha people like me! Bilingual DVD / 120 min.